Intersurgical Ltd designs and manufactures respiratory products that are used in hospitals throughout the world. 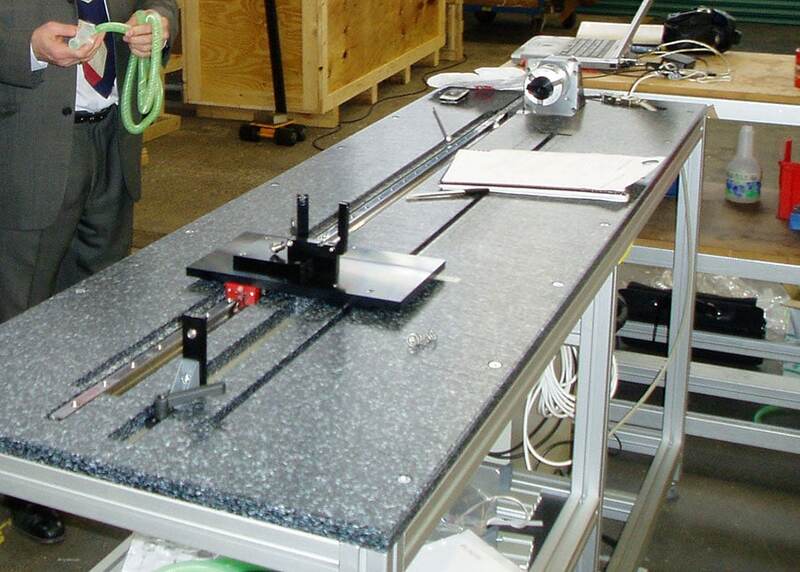 In an industry demanding the highest levels of quality control, engineers at its Wokingham headquarters develop special purpose machinery and production techniques for manufacturing facilities located throughout, Europe, Asia and the Americas. When a coil-winding process for breathing tube heating filaments required optimisation, Intersurgical came to us to devise a customised solution. The flexible plastic breathing tube is an integral component for Intersurgical’s patient airway respiratory systems that are used in the operating theatre and for intensive care. As part of the airway management process, active or passive humidification is introduced to the air or gas mixture to ensure it is delivered at the correct moisture levels. Any resulting condensation is prevented from forming within the tube by electrically heating the spirally coiled filament which, depending upon the product, is wrapped as a single or dual coil around its outer or inner diameter. With the breathing tubes, that measure up to 22 mm diameter and 1.8 metres in length, the wound pitch of the filament is a critical factor in the respiratory system performance and this new machine has a dual role to develop an improved, more consistent winding procedure and to increase production throughput. The basic construction is similar to a lathe; with a three-jaw chuck driving a long 6.0 mm diameter mandrel around which the coil is formed and a 2-metre travel linear axis delivering the filament material at variable rations of rotation to linear movement. The linear traversing axis includes a carriage with a mounted sliding support fixture for the free end of the mandrel and a manual wire tensioning device. A simple stepper motor control system takes care of the synchronisation between the two axes to maintain the correct pitch for the wound coil and the ratio is adjustable externally by an operator to match different products and filament types. After satisfactory winding, a current is passed through the malleable coil material which effectively hardens and sets its dimensional characteristics before assembly within the flexible plastic tube in another process. Rather than use proprietary positioning stages which would over-engineer and make the solution much more expensive, we used linear motion guide bearings and a stepper motor driven belt drive for the linear axis with a stepper motor fixed to a standard three-jaw chuck for the rotary axis. 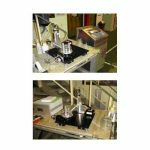 The two-axis positioning assembly is integrally mounted into a composite plastic table-top that provides a very clean, durable and cost-effective assembly area. The table top, together with a control cabinet is mounted on an extruded aluminium framing system from MiniTec profile system range for a neat and attractive support solution. The complete positioning assembly more than provides the accuracy, speed and performance required and matched the customer’s budget.